"Oh really, how cool, you wrote a book?" "Yes. Well, a trilogy actually." "Oh cool, what genre is it?" "YA. YA Urban Fantasy. YA Urban Fantasy Dystopia. YA Urban Fantasy Dystopia Post-Apocalypse." "YA Urban Fantasy Dystopia Post-Apocalypse?" At that point the conversation usually dries up. My interlocutor necks the rest of their wine, and suddenly remembers they have somewhere else important to be, but I swear it’s true. The Skyscraper Throne trilogy, my series about a teenaged graffiti artist and her poet best friend pulled into a world of runaway train ghosts, living reflections and crane fingered demolition gods, really is of all these genres, and maybe more. Genre, you see, is a taxonomy, a periodic table for literature, but the truth is, almost all books are compounds, not individual elements. But while which genres to file a particular story under is ultimately up to the reader, it’s the writer who gets to choose the tropes they’ll use to judge it. But how to choose? Tropes are just story elements—all that marks them out as special is the frequency with which we use them. For me, the first element in any story is the theme. Theme is just a fancy word for ‘what the story’s about,’ and my themes... they kind of snowballed. The first thing I knew about the trilogy, you see, was that I wanted to tell a story about growing up, so YA made sense. The City’s Son was about two girls pulled into a magical world hidden beneath the skin of everyday London. This is an Urban Fantasy trope so tropey that it barely even registers—it’s practically definitional of the genre—but it’s also as neat a metaphor for one’s first, faltering steps into adulthood as I can think of: a world at once strange and familiar, exciting and frightening, that you’ve lived in every day of your life but never really seen until now. In the second novel—The Glass Republic—our scarred protagonist is pulled into an aesthetic dictatorship, a parallel city inside reflections where the full measure of your worth is judged by your face, and the standards of beauty are set by a proud and ruthless Mirrorstocracy. Again, the core idea of a repressive regime is hardly original, but the resonance of a teen testing themselves against the rules and limits of their new world, and deciding how much they will shape those limits and how far they’ll allow them to shape them... for me that was the perfect second act. And the final apocalyptic act? Bringing the world-that-is-London to the brink of destruction by an urban plague: streets running at 1000 degree fevers, windows and doors vanishing to leave citizens sealed up in brick, solid roads turning in an instant to a liquid so thin you can’t swim in it, just sink and let it fill your nostrils? All that is because when you’ve grown up—really grown up—you can never go home again. Maybe that’s why I think of being grown-up (past tense) as a synonym for death. Anyway, that’s how one series gets to be in (at least) four sub genres. So I’ll throw it over to you, dear internet friend, what’s your favourite genre: horror? Police procedural? Romance? And much more importantly—what do those genres say to you? 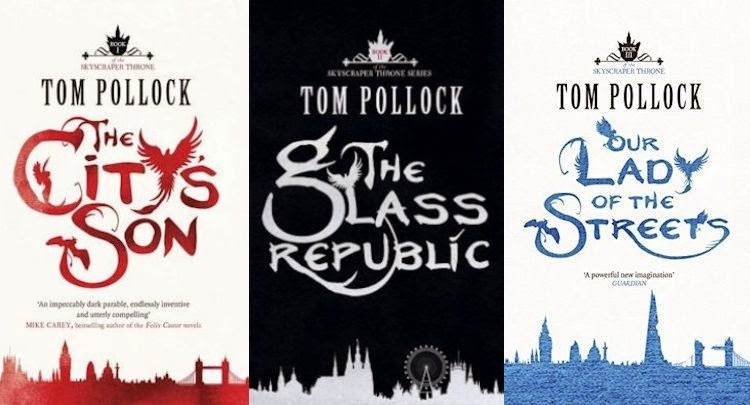 Inventor of monsters and hugger of bears, Tom Pollock writes fantasy, and writes about fantasy. Say hey to him on twitter @tomhpollock or by way of his website.